Cookie Monster Cupcakes with a Full Tummy! These fun and easy to make cupcakes are perfect for children’s parties, family get togethers and charity bake sales. These past few weeks has seemingly seen Cookie Monster, from Sesame Street, along with his friends Big Bird, Elmo, Bert and Ernie, and Count von Count everywhere. They’ve been on tv trailers and even the One Show where Cookie Monster was a little ‘upset’ having had to wait for his cookie which, when he did get his jaws around it, sent crumbs all over the place! He’s even been in the Only Crumbs Remain kitchen! 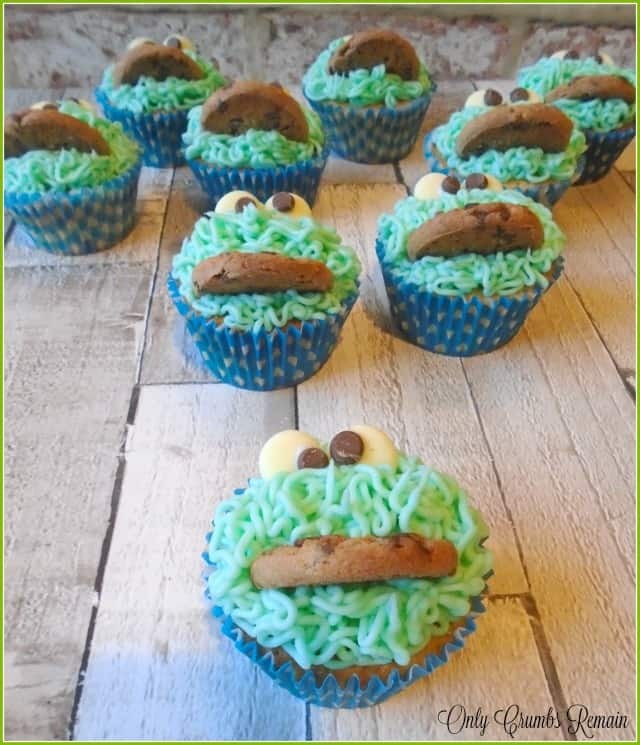 OK, perhaps not Cookie Monster himself, leaving crumbs in his wake, but rather in the guise of Cookie Monster Cupcakes! They proved to be incredibly popular at the charity bake sale, they were gone in a flash having been bought largely by those with young children. cookie. They really do resemble the greedy, cookie loving, Seseme Street character! The recipe below is a little more extravagent and naughty than most though. 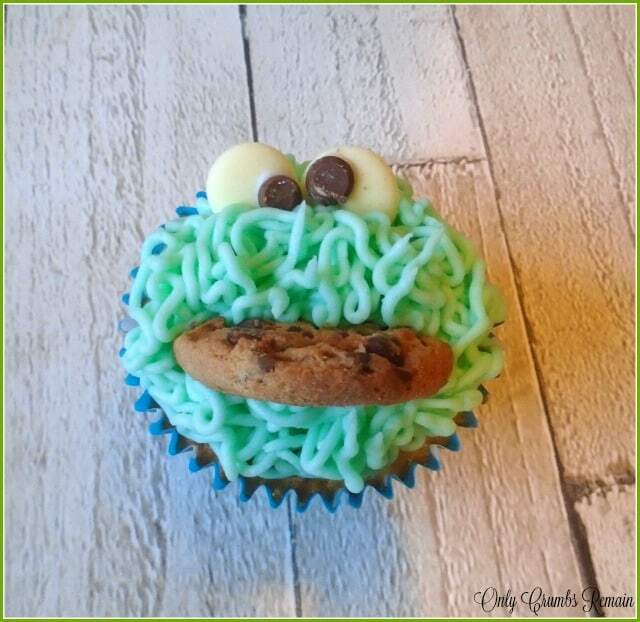 Our Cookie Monster Cupcake recipe not only has the ruffled buttercream fur, chocolate goofy eyes, and a half eaten cookie, but also has a full tummy in the form of chocolate chips in the sponge and a chocolate ganache piped into the centre of the baked cupcake. After all, any self resepcting Cookie Monster will surely have a tummy full of chocolate! As mentioned above, these Cookie Monster Cupcakes are surprisingly easy to make. In fact they’re very easy to make! To share how to make a Cookie Monster Cupcake and to, hopefully, convey how easy they are to assemble I’ve attempted to shoot a video, below, which you may like to watch! So, let’s get to it and bake Cookie Monsters with a Full Tummy of Ganache! 1. Preheat the oven to 190 / Fan 170 / Gas 5. Place the muffin sized cases into the muffin tray.2. Make the sponge. Place the margarine or soft butter and sugars into a good sized bowl and beat together with a wooden spoon or electric beaters until very pale and fluffy. Add the salt and vanilla extract and beat again to combine. Gradually add the beaten egg a little at a time, beating well after each addition. Beat in the milk. Sieve the flour into the mixture. Use a spatula, large metal spoon or your hand with your fingers splayed to fold this in gently. Add the chocolate chips (optional) and mix gently to combine. 3. Fill the muffin cases. Using a teaspoon, fill the cases with the batter mixture. You’re aiming for them to be half to two-thirds full. You may decide to weigh each muffin to ensure equal sizes. Each will weigh about 62g.4. Bake. Place the muffin tray in the centre of the oven and bake for about 20 – 23 minutes. You may need to rotate the tray after 15 minutes of baking. Once baked, remove from the oven and place on a cooling tray.5. Make the ganache. Break the chocolate into small pieces. Place into a bowl. Pour the cream into a small pan and set on the hob over a medium heat. Once the cream is almost at boiling point pour it over the chocolate. Stir until the ganache is smooth and glossy. Set aside. 6. Make the cookie monster eyes. Carefully trim off the tips of the milk chocolate drops if you feel it necessary. Place the icing sugar into a cup or small bowl. Add two or three drips of water and mix to a thick paste, adding a little more water as necessary. Use a teaspoon or knife to place a little of the water icing onto the back of a chocolate chip. Affix on to the white chocolate button off-centre. Repeat to make as many eyes as required. Set aside to dry. 7. Prepare the cookies. Use a large sharp knife to cut the biscuits – aiming for one piece to be slightly larger than the other. 8. Make the buttercream. Place the softened butter into a good sized bowl. Beat to ensure it is soft and creamy. Sieve half of the icing sugar into the butter. Use a wooden spoon to combine the two ingredients. Sieve in the remaining icing sugar and beat to combine. Beat well to create a creamy frosting. Add some of the blue colour paste and mix until well combined and not streaky. Add a little milk and beat to combine. Spoon the mixture into a piping bag fitted with a ‘grass’ nozzle.9. Hollow out the cupcakes. Use a paring knife or the wide end of a large piping nozzle to create a round hollow in the top of the cupcake. Use a small fork to gently pull away a little more sponge to make the hole deeper to therefore hold more ganache. 10. Assemble. Spoon or pipe (no nozzle required) the ganache into the hollow of the cupcakes. Pipe the buttercream over the top of the cupcake (think messy cookie monster fur!) Position two eyes into the buttercream. Afix one of the larger cookie halves into the buttercream where his mouth would be. 11. Enjoy! a) Rather than using white chocolate buttons and chocolate drops to create the ‘eyes’ of Cookie Monster, consider using marshamallows and a coloured water icing. b) Be aware that you may have one or two breakages when cutting the chocolate chip cookies. Off cuts of cookies could be simply eaten & enjoyed or perhaps be crushed down to be used as a bisuit base of a cheesecake. c) Use a food gel to colour the frosting rather than a liquid. d) We used Dr Oekter’s blue (vegetarian) to colour the frosting, other brands like Sugar Flair may have a better defined colour. e) The amount of colour gel needed in the frosting will depend upon the brand purchased, therefore use a little to start with adding more as necessary to achieve the depth of blue you want. f) If you don’t have a ‘grass’ piping nozzle consider using a small star nozzle to pipe the surface of the cupcake with a cluster of rosettes. Or simply spread the frosting on with a pallet knife and ruffle it up with the back of the knife to create a messy fur appearance. 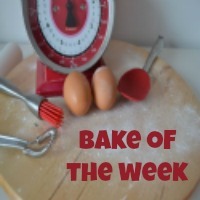 Bake of the Week co-hosted by Jenny at Mummy Mishaps & Helen at Casa Costello. 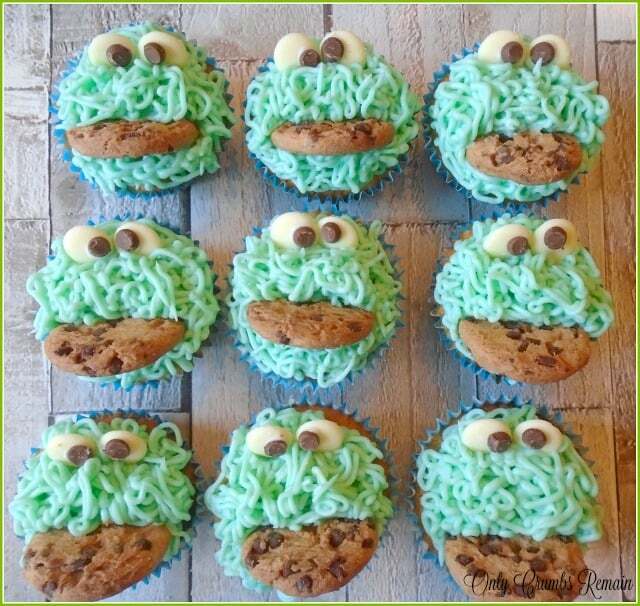 My little man would love these, he loves the cookie monster and walks around saying "cooooookies" all the time (well when he wants cookies which is pretty much all the time!). I love the idea of the sneaky ganache filling too – yum! Love these Angela! They are so cute and I just know how much my kids would LOVE them. I love the fact that these cookie monsters have got a tummy full of ganache as well! My kids would love them and I'd have certainly bought a couple for my little ones if I'd been at your husband's office cake sale! They really are easy to make Cliona, and would make a fun activity for the youngsters to get involved in.